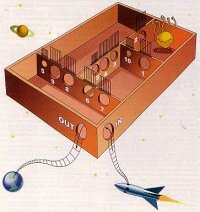 This puzzle is actually based on an ancient problem, and shown here is the only solution of which I am aware. To satisfy yourself that the pieces are in fact the same size and shape, you can draw this pattern on a piece of paper, cut out the pieces, and superimpose them on one another. It's also possible for the children to divide the yin and the yang into four pieces with the same area but different shapes by a single extra cut. Can you figure out how? Please send your answers to Clifford A. Pickover, c/o DISCOVER, 114 Fifth Avenue, New York, N.Y. 10011-5690. Suppose that the aliens aim for some point P on the edge of the Continuum. Create a reflection of S in the Continuum and call it S'. Then the distance SPA equals S'PA, which will be shortest when S'PA is a straight line. 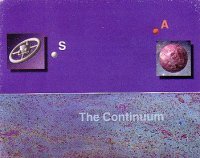 It follows that P is the point such that SP and PA make the same angle with the edge of the Continuum. (In the first century A. D., Hero of Alexandria used a similar argument to conclude that when light is reflected from a mirror, the angles of incidence and reflection are equal). 1. Eldon White has four dogs. One day he put out a bowl of dog biscuits. The eldest dog came first and ate half the biscuits plus one more. Then the next dog came and ate half of what he found plus one more. Then the next one came and ate half of what she found plus one more. Then the little one came and ate half of what she found and one more, and that finished the biscuits. How many biscuits were originally in the bowl? 2. Eldon once bought a very remarkable plant, which, on the first day, increased its height by a half, on the second day by a third, on the third day by a quarter, and so on. How many days did it take to grow to 100 times its original height? 1. This problem is best solved by working it backward. How many biscuits did the fourth dog find? Well, dividing that number by 2 and subtracting 1, we get 0. Reversing the procedure, adding 1 to 0 and then multiplying by 2, we get 2. Thus the last dog found 2 biscuits. Adding 1 and multiplying by 2, we get 6, the number of biscuits found by the third dog. Adding 1 and multiplying by 2, we get 14, the number found by the second dog. Finally, adding 1 and multiplying by 2, we get 30, the number of biscuits originally in the bowl. 2. The plant was initially, say, 1unit tall (the length of a unit really doesn't matter). After one day the plant was 1½ units tall. The next day it gained 1/3 of 1½, which is ½ , so it was then 2 units tall. The day after that, it gained ¼ of 2, which is again ½. So the plant actually gained ½ unit each day. After 198 days it gained 99 units, and it was then 100 times its height on the first day. Thus the answer is 198 days. 3. Let x be the age of each twin and y be the age of Laura. Then y = x+ 9 and y + 9 = 2x. This makes x = 18 and y = 27. Thus the twins are 18 and Laura 27. 1. 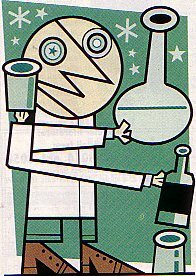 The Chemist - not an Alchemist, though his name might suggest it - one day partially filled a container with some concoction or other. He knew the volume of fluid in the container, as well as the volume of empty space, and realized that two-thirds of the former was equal to four-fifths of the latter. Was the container then less than half full, more than half full, or exactly half full? 2. On another occasion, Al made a mixture of water and wine. There was more water than wine - in fact, the excess of water over wine was equal to one-fourth the quantity of wine. Al then added 12 ounces of wine, at which point there was one ounce more of wine than water. According to another version of the story, before Al added the 12 ounces of wine, he first boiled off 12 ounces of water (the net effect being that he replaced 12 ounces of water with wine), and again there was one more ounce of wine than water. Would there be more mixture present at the end of the first version or the second? 1. Let x be the amount of fluid in the container and y be the amount the container would hold if full. The volume of empty space is then y-x, so 2/3x = 4/5(y-x). This makes x = 6/11y, so the container is 6/11 full, which is more than half. 2. Since fluid was added in the first version but not in the second (in which 12 ounces of water was merely replaced by 12 ounces of wine), it might be tempting to conclude that the quantity of fluid at the end of the first version would be greater than at the end of the second, but this would be wrong, as we will now see. For the first version, let x be the amount of wine initially present and y the amount of water.Then the excess of water over wine is y-x. Thus y-x = 1/4x, which makes y = 5/4x. After adding 12 ounces of wine, there is then one more ounce of wine than water, so x+12 = y +1, and so y = x+11. And since y = 5/4x, we get x = 44 and y = 55. Thus, according to this version, there was initially 99 ounces of mixture and later, 111ounces. For the second version, we still have the first equation y-x = ¼ x, but the second equation is now x+12 = (y-12) + 1. This makes x = 92 and y = 115. Thus 207 ounces of mixture remained at the end of the second version, which is more than the 111 ounces of the first version. The Tarantula nebula, a mix of gaz and dust in the large magellanic cloud, one of the Milky Way's two company galaxies, is a nice place to visit - if the inhabitants are not around. One day while exploring the nebula, you are abducted by the mathematical Tarantulans. If you ever wants to return to Earth, they tell you, you must pass a test They take you to a chamber floating in space, made of rooms connected by holes in the walls. You start at IN, fly through the holes, and finally leave at OUT. Each time you fly through a hole, you add the number next to the hole to your cumulative sum. To leave at OUT you must have flown through every room at least once and have achieved a sum of exactly 30. The Tarantulans want to make your life hell! In the back room lurks a Tarantulan guard who makes sure you can never enter his room through the "2" orifice. To make matters worse, the diabolical Tarantulans have rigged the orifices so that each one you pass through closes behind you, never to open again. Diagrammed here is one solution (5+4+10+2+9), going through only five holes. Here are several other solutions: (6+10+2+3+4+5), (6+4+3+10+2+5), (9+4+10+2+5), and (5+5+10+2+8). How many others can you find? What's the largest sum you can create and still escape? (Remember, an orifice closes each time you step through it). How many different ways can you create a given sum? It turns out, for example, that 41 is a special number because there seem to be more than 1000 paths that add up to this sum. On the other hand, there is no way to create a sum of 52, as far as I can tell. Can you find any other "impossible Tarantulan sums?" Please send your answers to Clifford A. Pickover, c/o DISCOVER, 114 Fifth Ave., New York, N. Y. 10011-5690. I went to Lakewood the other day to attend an auction sale of some land, but did not make any purchases on account of a peculiar problem which developed. The land was advertised as shown in the posters on the fence as 560 acres, including a triangular lake. The three plots show the 560 acres without the lake, but since the lake was included in the sale, I, as well as other would-be purchasers, wished to know whether the lake area was really deducted from the land. The auctioneer guaranteed 560 acres "more or less". This was not satisfactory to the purchasers, so we left him arguing with some katydids, and shouting to the bullfrogs in the lake, which in reality was a swamp. The question I ask our puzzlists is to determine how many acres there would be in that triangular lake, surrounded as shown by square plots of 370, 116 and 74 acres. Form a right-angled triangle ABD with sides 9 = 4 + 5 and 17 = 7 + 10. By the Pythagorean theorem, the square of the hypothenuse AB is given by AB2 = 92 + 172 = 81 + 289 = 370 - exactly the size in acres of the biggest square in the diagram. Thinking of D as the origin, find point C with coordinates (7, 4). Let CE AD, and CF BD. In ACE, the Pythagorean theorem gives AC2 = 52 + 72 = 25 + 49 = 74 - another square in the diagram. To get the third square apply the Pythagorean theorem to BFC: BC2 = 42 + 102 = 16 + 100 = 116, which proves that ABC is exactly of the shape of the triangular lake. Now then S(ABC) = S(ABD) - S(ACE) - S(BFC) - S(CEDF) = 9·17/2 - 5·7/2 - 4·10/2 - 4·7. We thus obtain S(ABC) = 76.5 - 17.5 - 20 - 28 = 11. 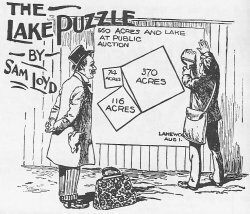 As Sam Loyd notes: In this remarkable problem we find that the lake contains exactly 11 acres, therefore the approximate answer of "nearly 11 acres" is not sufficiently correct. The poet Longfellow was a fine mathematician who often spoke about the advantages of clothing mathematical problems in such attractive garb that they would appeal to the fancy of the student instead of following the dry, technical language of the textbooks. The flower was one span above the surface of the water, and when swayed by the breeze would touch the surface at a distance of two cubits, from which data one could compute the depth of the lake. Euclid says: "When two chords of an are intersect within acircle, the products of the parts of one will be equal to the products of the parts of the other." In the following illustration the surface of the water forms the chord of one are, and since each part of this chord is 21 inches, the product is 441 inches. The stem of the lily forms the other intersecting chord, and as its height above the water forms one part of the chord, that part, 10 inches, multiplied by the other part, must be the same as the 441 inches obtained by the parts of the other chord. So divide 441 by 10, and we get 44.1 inches as the other part of that chord. Adding the 10 and the 44.1,we get 54.1 for the total length of the chord from A to F, which is the diameter of the circle.This we must halve to get the radius, 27.05, but as the flower stood ten inches above the surface of the water, we must deduct that ten inches to obtain the depth of the lake - 17.05 inches. 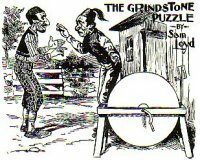 It is told that two honest Syrians pooled their savings and bought a grindstone. Because they lived several miles apart, they agreed that the elder man should keep the grindstone until he had reduced it in sire by just one-half, then it should be turned over to the other. The best method of solving this problem is based on the fact that areas of circles are proportional to the squares of their diameters. 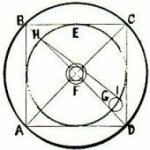 If we inscribe a square, ABCD, on a circle the size of the original grindstone, then circle E, inscribed within that square, will have exactly one-half the area of the larger circle. 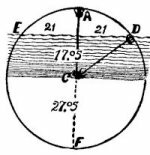 Half the area of the grindstone's hole must now be added to circle E. To do this we inscribe a square on the hole, and within this square we inscribe a circle. The smaller circle will therefore be half the area of the hole. We place the small circle at G so that its diameter forms the side of a right triangle, the base of which is the diameter of circle E.
The diameter of circle E is the same as the side of the largest square. Knowing the diagonal of this square to be 22 inches, we arrive at the square root of 242 for the side of the square and the diameter of circle E. A similar procedure shows the diameter of the smallest circle to be the square root of 242/49. 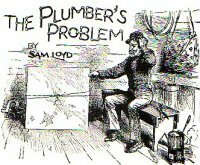 HERE is a practical plumbing lesson which will interest those of a mechanical turn of mind. Plumbers, boilermakers and tank builders estimate in cubic feet, reckoning seven and a half' gallons to the cubic foot, which is close enough for all practical purpose. Of course a mathematician would tell us that there are 1,728 cubic inches to a cubic foot, because 12x12x12 = 1,728, while to seven and one-half gallons there are 1,732½, cubic inches, but then plumbers are a liberal set of fellows who cheerfully throw in the extra four and a half inches. A plumber wanted to estimate the lowest possible cost of a copper tank to hold 1,000 cubic feet. Copper comes in sheets three feet square, worth $1.00 per square foot, so the problem is to determine the most economical dimensions of a rectangular tank capable of holding 1,000 cubic feet. It is self evident that if the bottom of the copper tank is ten feet square, 10 multiplied by 10 gives 100 as the area of the bottom, which multiplied by 10 for the depth, gives the correct dimensions of a tank which will hold 1,000 cubic feet. A cube ten feet square will hold 1,000 cubic feet it is true, but that would require 500 feet of copper (100 on the bottom and each of the four sides). The point of our problem is to determine the most economical form of a tank that will hold 1,000 cubic feet and use the least possible amount of copper. In the plumber's problem it will be found that a tank with a square base, twice as wide as it is deep, gives the most economical form. 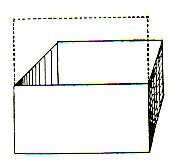 If a cube close to 12.6 feet square holds 2,000 cubic feet, then half that depth would give the required 1,000 cubic feet. 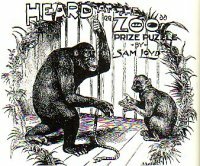 Many years ago, when Barnum's Circus was of a truth "the greatest show on earth," the famous showman got me to prepare for him a series of prize puzzles for advertising purposes. They became widely known as the Questions of the Sphinx, on account of the large prizes offered to any one who could master them. Barnum was particularly pleased with the problem of the cat and dog race, letting it be known far and wide that on a certain first day of April he would give the answer and award the prizes, or, as he aptly put it, "let the cat out of the bag, for the benefit of those most concerned." The wording of the puzzle was as follows: "A trained cat and dog run a race, one hundred feet straightaway and return. The dog leaps three feet at each bound and the cat but two, but then she makes three leaps to his two. Now, under those circumstances, what are the possible outcomes of the race?" The cat wins, of course. It has to make precisely 100 leaps to complete the distance and return. The dog, on the contrary, is compelled to go 102 feet and back. Its thirty-third leap takes it to the 99-foot mark and so another leap, carrying it two feet beyond the mark, becomes necessary. In all, the dog must make 68 leaps to go the distance. But it jumps only two­thirds as quickly as the cat, so that while the cat is making 100 leaps the dog cannot make quite 67. But Barnum had an April Fool possibility up his sleeve. Suppose that the cat is named Sir Thomas and the dog is female! 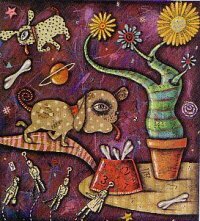 The phrase "she makes three leaps to his two" would then mean that the dog would go 9 feet while the cat went 4. Thus when the dog finishes the race in 68 leaps, the cat will have traveled only 90 feet and 8 inches. Here is a remarkable age problem which I am sure will amuse the young folks and at the same time open up a new line of reasoning for some of the wiseacres who make a specialty of statistical calculations. It appears that an ingenious orr eccentric teacher, as the case may be, desirous of bringing together a number of older pupils into a class he was forming, offered to give a prize each day to the side of boys or girls whose combined ages would prove to be the greatest. The next day the girl brought her sister to school. It was found that their combined ages were just twice that of the boy, so the two girls divided the prize. When school opened the next clay, however, the boy had recruited one of his brothers. It was found that the combined ages of the two boys were exactly twice as much as the ages of the two girls, so the boys carried off the honors that day and divided the prize between them. The battle waxed warm now between the Jones and Brown families, and on the fourth day the two girls appeared accompanied by their elder sister; so it was then the combined ages of the three girls against the two boys. The girls won of course, once more bringing their ages up to just twice that of the boys. The struggle went on until the class was filled up, but our problem does not need to go further than this point. Tell me the age of that first boy, provided that the last young lady joined the class on her twenty-first birthday. The first girl was just 638 days old, and the boy twice as much, namely 1,276 days. The next day the youngest girl will be 639 days old, and her new recruit 1,915 days, total, 2,554 days, which doubles that of the first boy, who having gained one day, will be 1,277 days old. The next day the boy, being 1,278 days old, brings his big brother, who is 3,834 days old, so their combined ages amount to 5,112 days, just twice the ages of the girls who will now be 640 and 1,916, or 2,556. The next day, the girls gaining one day each, will represent 2,558 days, which added to 7,670 days of the last recruit, brings their sum total to 10,228 days, just twice that of the two boys, which, with the two points added for the last day, would be increased to 5,114 days. We arrive at the 7,670 days as follows. The young lady having reached her twenty-first birthday, 21 times 365 equals 7,665 plus 4 days for four leap years, and the extra one day which is the day of her twenty-first birthday. Those who gave the boy's age as 3½ years overlooked the feature of increasing the ages of the pupils from day to day. Here is a pretty problem which I figured out during a ride from Bixley to Quixley astride a razor-back mule. I asked Don Pedro, a native guide who walked ahead of me pulling the mule forward by its reins, if my steed had another gait. He said it had but that it was much slower, so I pursued my journey at uniform speed. To encourage Don Pedro, who was my chief propelling power, I said we would pass through Pixley, so as to get some liquid refreshments; and from that moment he could think of nothing but Pixley. After we had been traveling for forty minutes I asked how far we had gone. Don Pedro replied: "Just half as far as it is to Pixley." After creeping along for seven miles more I asked: "How far is it to Quixley?" He replied as before: "Just half as far as it is to Pixley." Loyd's answer makes use of the two time intervals given in the problem, but as Ronald C. Read, of Kingston, Jamaica, points out, these time intervals are not really needed in order to solve the problem. Let x be the point (between Bixley and Pixley) where the first question is asked, and y the point (between Pixley and Quixley) where the second question is asked. The distance from x to y, we are told, is 7 miles. Since the distance from x to Pixley is 2/3 the distance between Bixley and Pixley, and the distance from y to Pixley is 2/3 the distance between Pixley and Quixley, it follows that the distance between x and y, or 7 miles, is 2/3 the total distance. This makes the total distance 10½ miles. - M.G. To show how difficult it is for the average person to leave the beaten track when thinking out some simple problem, let us take a look at the decimal system of numeration with which we are all familiar. It is safe to say that most people have given little thought to the subject. They see that any column can be built up to 9, but as soon as it gets above 9, it is carried over to the column on the left. They think it is so because it must be so, and can't help itself any more than 1 and 2 can help being 3. But this is far from the case. Primitive man originally learned to calculate upon the fingers of both hands, just as we see many people today utilizing their fingers in some every-day transaction. Hence the introduction of the decimal system. If the human race, as has been claimed, sprang from the Angwarribo family of monkeys, who have but four fingers, and we had not taken on that extra finger, we would have continued to calculate in what is known as the octamal system. From a mathematical standpoint, it can be shown that the decimal system is not as perfect as some of the others, and that for some purposes the septamal, which only runs up to 7, is better. In that notation 66 would mean six 7's and six 1's, so the addition of 1 more would change it to 100, which would be equal to only 49 in our decimal notation. You see, 1 added to the 6 in the unit column would change it to 7, so we would have to place a 0 and carry 1 on to the other 6 which in turn becomes a 7, so we place another 0 and carry the 1 to the third column, making it 100, which stands for 49. In this same way, 222 represents 114 - two units, two 7's and two 49's. In the octamal system 1906 is written 3562, which represents two units, six 8's, five 64's and three 512's. The simple procedure for arriving at this number is first to divide 1906 by 512 to obtain 3. The remainder, 370, is then divided by 64 to obtain 5. The remainder, 50, is divided by 8 to get 6, and the final remainder of 2 is of course the last digit of the answer. Had we wished to convert 1906 to the septamal system we would have followed a similar procedure, dividing by the successive multiples of 7. - M.G. 1. 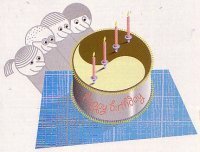 Once when entertaining at a children's birthday party, I went into the kitchen and found three peaches, three plums, and three paper bags. In one hag I put two peaches, in one I put two plums, and in the remaining bag (the "mixed bag "). I put a peach and a plum. I brought the three bags into the living room, where the company was assembled, picked three children named Arthur, Lillian, and Robert, and gave them each a bag. I then explained to the company that one of the three held two peaches, one held two plums, and one held the mixed bag - one peach and one plum - but didn't tell them who held what. I then said tothe three children: "I want each of you to peek into your bag and tell the company what you have, but I want each of you to lie!" Arthur said, "I have two peaches"; Lillian said, "I have two plums"; and Robert said, "I have one peach and one plum." "Very good," I said. "I see that each of you has lied, as I requested. From now on, I want each of you to tell the truth." I then gave pencils and paper to the company and told them: "You are to figure out a strategy whereby you successively ask each of the three to pull out one fruit that he or she is holding and show it to you, until you can deduce which bag is really the mixed bag. Remember, the answers you get will now be truthful. 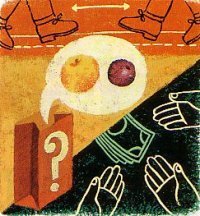 The first one to come up with a strategy involving the minimum possible number of necessary questions will be allowed to try it and, if successful, will win a prize." After a time, Violet, a very clever girl, came up with a minimal strategy, and it worked! What is the strategy, and what is the minimum number of necessary questions? 2. After this I gave the group the problem of two men, four miles apart, starting at the same instant, walking toward each other, one at the rate of three miles an hour and the other at the rate of two miles an hour. How far apart will they be two minutes before they meet? 3. Next I gave the problem about a certain trust fund that provided a weekly allowance to a certain club. The allowance was divided equally among the members. One day a new member entered the club. The weekly allowance did not change, but thanks to the new member, each got $5 a week less than formerly (the allowance was still distributed equally among the members). This situation lasted for one year. Then two members dropped out, and as a result each remaining member got $12 a week more than in the year before. 1. Only one question is necessary, and that is sufficient to determine the contents of each of the three bags! You should ask Robert (who falsely claimed to have the mixed bag) to show you one of the fruits he has in his bag. Suppose he pulls out and shows you a plum. Then you know that the other fruit in Robert's bag is also a plum (since the bag is not mixed). Arthur's bag doesn't really have two peaches, as Arthur falsely claimed, nor can it have two plums (since there are only three plums altogether, and Robert has two of them); hence Arthur must have the mixed bag (and hence also Lillian has two peaches). On the other hand, if Robert showed you a peach instead of a plum, then by symmetric reasoning, Robert would have two peaches. Lillian would have the mixed bag, and Arthur would have two plums. 3. a) Let y be the number of people initially in the club, and let x be the number of dollars that each person receives per week. Then xy is the weekly allowance to the club. b) After the new member joined, there were y + 1 people, each getting x- 5 dollars per week, so (y+1)(x-5)=xy. Thus xy-5y+x-5 =xy, so x-5y-5=0 (a linear equation). c) Then two members left, so there were y-1 members, each getting (x-5)+12 dollars per week, which is x+7 dollars per week. Thus (y-1)(x+7)=xy, which yields xy+7y-x-7= xy, which in turn yields 7y-x-7=0. Solving this equation simultaneously with the equation x-5y-5=0 (from part b above), we get y=6 and x=35. Thus there were originally six members in the club, each getting $35 a week, totaling a $210-a-week allowance to the club. 1. Four Romans-Virgil, Catullus, Lucretius, and Julius Caesar - were seated around a table, and each was drinking a different beverage. Use the following clues to figure out who drank which beverage. a. The man who drank juice sat across from Catullus. b. The man who sat to the right of Lucretius drank water. c. Virgil never drank milk. d. Julius Caesar sat across from Virgil. e. The man who drank wine sat to the left of the man who drank milk. 2. Five Greek soldiers were marching in single file, and each was carrying a different weapon. Use the following clues to figure out who carried which weapon and in what order they were marching. a. Themistocles marched just behind Alexander. b. Alcibiades was just behind Thucydides and ahead of Philip. c. The man with the sword was just in front of the man with the spear, but he was not first in line. d. The last man in line carried neither the bow and arrow nor the slingshot. e. Alcibiades carried neither the sword nor the sarissa. f. The man who marched first carried neither the sarissa nor the slingshot. g. The man carrying the spear came before Alcibiades. Fill each yellow square with an operation (+,-,x,/) and each green square with a different number (from 1 to 9) so that each row and column makes a true equation. Every number 1 to 9 will appear just once. Use parentheses when needed. - Julius Caesar drank milk. - Alexander, bow and arrow. Note: The "/" in the middle column could also be an "x". Pick up two adjacent glasses at a time and in four moves change the positions so that each alternate glass will be empty. For readers interested in parlor tricks, here is an amusing puzzle which can be used advantageously to amuse the guests after a banquet or at an evening party. In the former case eight wine glasses - four empty and four partially filled - illustrate the trick to perfection. In this, as in all exhibitions of a similar character, everything depends upon the skill and clever acting of the performer. He must have his little book down to perfection, so as to be able to do the trick forwards or backwards without the slightest hesitation, while by the aid of a ceaseless flow of conversation he impresses upon his hearers the fact of its being the most simple little trick that ever happened, which anyone can do unless he be a natural born muttonhead or hopelessly befuddled. It really looks so simple that almost anyone will be lured into accepting an invitation to step up and test his sobriety by showing how readily he can perform the feat and then the fun begins - for it will rattle ninety-nine out of a hundred. That odd little sleight-of-hand performance with the four empty and four full glasses can readily be remembered by the following rule: One long move, two short ones, then one long one. First move 2 and 3 to the extreme end; then fill the gap with 5 and 6. Fill gap with 8 and 2; then finish with 1 and 5. STUDENTS of geometry will find here an interesting elementary problem which can best be solved by experimental puzzle methods, although there is a scientific rule for getting the correct answer which bears a close resemblance to the famous forty-seventh proposition of Euclid. 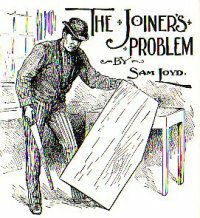 The joiner has a piece of board four feet long by two feet wide, with a corner clipped off. The puzzle is to divide the board into the fewest number of pieces, so that without any waste they will fit together and make a perfect square top for the table shown in the picture. In this particular case the missing piece has been cut off at an angle of fifteen degrees, but when you solve the puzzle you will find that the cutting procedure will work just as well when this angle is greater or less than shown here. The best answer requires only two straight cuts and the turning over of one piece, a practical piece of carpentering which some of the followers of Euclid did not think of. It makes no difference if the angle from D to B be more or less acute. Simply draw a line from the center of the left side to the midle of line BD. Then draw a perpendicular line from corner G to line EC. Turn over piece A and the three pieces will form the square as shown. Close the sedan chair by cutting it into the smallest number of pieces. "SPEAKING about modes of conveyance in China," says a writer who has spent most of his life in the Flowery Kingdom, "one soon gets used to being carried around in a sedan chair, which is far more comfortable and expeditious than a hack. These chairs are made of rattan wicker and remind you very much of those little Chinese puzzle boxes made of colored straws and so cleverly put together that you cannot discover where they are joined." All this is suggestive of a clever puzzle, for those sedan chairs will close up to make a covered box when it rains, yet the closest examination will not detect where the pieces are joined. 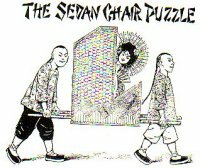 To illustrate the puzzle, you are asked to cut the chair into the fewest possible pieces which will fit together and form a perfect square. This is the first of many "dissection" problems included in this collection. It may interest the reader to know that there is a proof by David Hilbert that any polygon can be sliced into a finite number of pieces which can be rearranged to form any other polygon of equal area. Such dissections are of little interest, however, unless the number of required pieces is small enough to make the dissection elegant and surprising. Almost all simple and regular polygons (except the pentagram or five-pointed star which offers formidable difficulties) have been exploited in dissection puzzles of great ingenuity. For a recent and excellent discussion of dissection theory see a series of articles by the mathematics staff of the college, University of Chicago, in The Mathematics Teacher, May, October, and December, 1956; February and May, 1957.-M.G. Divide the field into four identical parts, each containing a tree. THE TOWN of Four Oaks derives its name from the fact that one of the early settlers, who owned a large tract of land, left it to four sons with the stipulation that they "divide it into equal portions, as indicated by the positions of four ancient oaks which had always served as landmarks." The sons were unable to divide the land amicably, since the four trees really furnished no clue to guide them, so they went to law over it and squandered the entire estate in what was known as the "battle of the four oaks." The person who told me this story thought it might form the groundwork for a good puzzle, which it has done, so far as suggesting a theme is concerned. The picture represents a square field with four ancient oak trees, equal distance apart, in a row from the center to one side of the field. The property was left to four sons who were instructed to divide the field into four pieces, each of the same shape and size, and so that each piece of land would contain one of the trees. The puzzle is an impromptu one, gotten up on the spur of the moment, so it is really not very difficult. Nevertheless it is safe to say that everyone will not hit upon the best possible answer. Rearrange the eight pieces to form a perfect checkerboard. IN the history of France is told an amusing story of how the Dauphin saved himself from an impending checkmate, while playing chess with the Duke of Burgundy, by smashing the chess board into eight pieces over the Duke's head. It is a story often quoted by chess writers to prove that it is not always politic to play to win, and has given rise to a strong line of attack in the game known as the King's gambit. The smashing of the chess board into eight pieces was the feature which always struck my youthful fancy because it might possibly contain the elements of an important problem. The restriction to eight pieces does not give scope for great difficulty or variety, but not feeling at liberty to depart from historical accuracy, I shall give our puzzlists a simple little problem suitable for summer weather. Show how to put the eight pieces together to form a perfect 8 x 8 checkerboard. 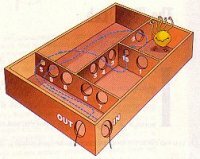 The puzzle is a simple one, given to teach a valuable rule which should be followed in the construction of puzzles of this kind. By giving no two pieces the same shape, other ways of doing the puzzle are prevented, and the feat is much more difficult of accomplishment. "Now, Tommy, our three ages combined amount to just seventy years. As I am just six times as old as you are now, it may be said that when I am but twice as old as you, our three combined ages will be twice what they are at present. Now let me see if you can tell me how old is mother?" Tommy, being bright at figures, readily solved the problem, but then he had the advantage of knowing his own age and could guess pretty closely the ages of the others. 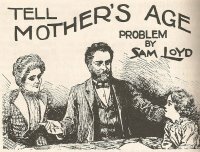 Our puzzlists, however, have merely the data regarding the comparative ages of father and son, followed by the startling question, "How old is mother?" The mother's age is 29 years and 2 months. Tommy's age is 5 years and 10 months, and the father is 35 years old. Cut the mosaic into parts which will form two squares. It is not generally known that the celebrated piece of Venetian mosaic by Domenichino, known as the Guiđo collection of Roman heads, was originally divided into two square groups, discovered at different periods. They were brought together and restored to what is supposed to be their correct form, in 1671. Apparently by accident it was discovered that each of the two squares consisted of pieces which would fit together into one 5 x 5 piece as shown. It is a pretty puzzle, and as many puzzles, like mathematical propositions, can be worked backward to advantage at times, we will reverse the problem and ask you to divide the large square into the fewest number of pieces which can be refitted into two squares. This puzzle differs from the Pythagorean principle of cutting lines on the bias. We know that two squares can be divided by diagonal lines to produce one larger square, and vice versa, but in this puzzle we must cut on the lines only, so as not to destroy the heads. 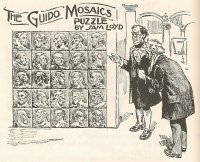 It may also be mentioned, incidentally, that students who have mastered the Pythagorean problem will not find much difficulty in discovering how many heads there must be in the smaller squares.